The Lebanon Mountain trail is the first long distance hiking trail in Lebanon and the Arab world. It extends 440km. from Qbaiyat in the north to Marjeyoun in the south. The LMT traverses 75 towns and villages at altitudes from 600m to 1900m. And perhaps most importantly, the trail showcases the natural beauty and cultural wealth of Lebanon’s mountains. ECODIT, a US company with a sister company in Lebanon, was a key element of the birth of the Lebanon Mountain Trail and its caretaker association, the LMTA. Today the Association maintains the LMT as well as the offshoot Baskinta Literary Trail, a 24-km long trail that highlights 22 literary landmarks in Lebanon related to acclaimed poets and novelists including, among others, Mikhail Naimy, Amin Maalouf, and Abdallah Ghanem. For details about the trail, maps, and much more, visit the LMT website or click the image to the right. 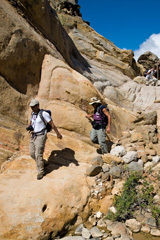 Numerous online resources exist for those interested in hiking the LMT. These include websites for reserves and the extensive Dhiafee Program that accommodates hikers along the trail.